Emily Wilkinson, an eight-year-old from Iowa, was in a hospital recovering from an emergency appendectomy. Doctors had diagnosed her appendicitis only after the pain became unbearable — weeks after she had been through tests for infections and bowel disease. It was an ordeal. Fortunately, she came through the appendix surgery, but that was only the beginning of her story. During the appendix surgery, doctors discovered that Kristi’s daughter had a rare tumor. It was a cancer of the gastrointestinal tract known as a carcinoid cancer. The fact that it had taken Emily’s doctors weeks to discover and name the cancer did not surprise anyone at the CCF, a non-profit advocacy group in White Plains, New York. Carcinoid cancer makes up more than 40 percent of all small intestinal malignant tumors. They can occur anywhere in the gastrointestinal tract and pancreas, though they are sometimes found in the lungs and elsewhere. About 12,000 cases are diagnosed each year in the US. When the tumors metastasize they can cause carcinoid syndrome, where tumors secret excessive levels of multiple hormones. That can cause symptoms including flushing, diarrhea, wheezing and heart failure. Because those symptoms are also found in other ailments, carcinoid cancer is frequently misdiagnosed, said Goldstein, who joined the organization 13 years ago. For example, if a patient has diarrhea a physician may think it is Chrohn’s Disease, or irritable bowel syndrome. The illness may also cause flushing. “If it’s a man that might get misdiagnosed as rosacea and if it’s a woman anywhere near menopause, she might be told its menopause,” Goldstein said. Part of the problem is that not only have most patients never heard of carcinoid cancer, but many physicians are not familiar with it either. 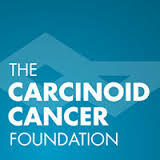 CCF’s mission is to help people better familiarize themselves with carcinoid cancer. The organization uses its website to post patients’ stories and information on the latest treatments and research. CCF also uses social media to help these patients connect with others and even find places where they can get help. The organization is small, with both their expenses and revenue coming in under $1 million, including donations from pharmaceutical companies. “We don’t have fundraisers but sometimes people do them for us,” Goldstein said. Goldstein, one of the few employees, works from a home office but makes the most of the small staff by relying on the website and social media to meet the foundation’s goals. A few years ago, Goldstein learned the true power of social media. When a blizzard shut down London’s Heathrow Airport a few years ago, she knew of a patient who traveled to the UK from Canada for treatment was stranded in the airport, trying to return home. “I Tweeted that a cancer patient was stuck in Heathrow and needed help, please,” she said, mentioning Heathrow airport's Twitter account. Somehow the airport was able to arrange for the woman to get on a flight home, even though thousands of other travelers spent the night in Heathrow. But besides helping people figure out their travels, the CCF site mainly serves as a support group where patients tell how they came to be diagnosed, what treatment has been like, and where others might try to find the best care. For instance, state-of-the-art diagnosis is available with a Gallium-68 scan, Goldstein said. Specialists can be hard to find as well. Other patients have told stories of paths that took them to the Mount Sinai Hospital offices of Richard Dr. R.P. Warner, the foundation’s medical director and expert on carcinoid cancer. Emily’s mother found a specialist in Iowa who worked at a hospital with a Gallium-68. Based on findings in those scans Emily got further surgery but is doing well, her mother reported on the website. The girl will need regular blood tests for 10 years. The tumors, while slow growing, could come back. That often happens with carcinoid cancer.